Narendra Modi of India is a Hindu Nazi and a mass murderer. That however is no bar to his being welcomed and feted in Western capitals because Western regimes believe there are economic gains to be had. Greed trumps principles. The nastiest prime minister India has ever produced — Narendra Modi — was given red carpet treatment during his three-day visit to Canada (April 15–17). Why such lavish reception for a mass murderer while religious minorities in India — Christians, Muslims and even Dalit (treated as “Untouchables” by racist Hindus) — are regularly targeted for killing in India? Western politicians have few scruples. They often talk about high sounding principles, morality and human rights, but personal interests always trump such considerations. This was evident not only in Canada but before his arrival in Canuckistan, Modi was feted in France and Germany. Canadian Prime Minister Stephen Harper accompanied Modi wherever he went during his three-day visit: Ottawa, Toronto and Vancouver, signifying the importance he gives to India because of its growing economy. True, there are rich pickings to be made but the manner in which human rights have been tossed aside gives the lie to tall claims by the West. Why should one expect Harper to care about the rights of Muslims, Dalits or even Christians in India when he does not care about the 1,200 missing and presumed dead Aboriginal women in Canada? When Peter Mansbridge of the CBC asked him whether his government was doing anything about the 1,200 missing Aboriginal women, Harper’s response was stunning, “They are not high on our list of priorities.” Mansbridge did not pursue the point. One wonders whether he would have shown the same deference to the leader of Russia or any other country that is considered unfriendly. Harper may have put human rights, morality and principles on the backburner for economic gain, there were hundreds of concerned Canadians that did not let Modi’s visit go without drawing attention to his long list of crimes. Both in Toronto and Vancouver, there were hundreds of placard-waving protesters that denounced Modi as a murderer and war criminal. He was reminded about the mass murder of 2,000 Muslims in Gujarat in February 2002 when Modi was chief minister of the state. Most of those killed were hacked to death with swords or burnt alive. The victims included a Muslim member of the Congress Party, Ahsan Jafri, who together with his wife was tortured and then hacked to pieces. Harper was unconcerned about such crimes and strongly shook Modi’s hands that were still dripping with the blood of innocent people. In fact, not once did Harper bring up such crimes. Instead, he was constantly talking about the great business opportunities that exist between the two countries. In order to underscore his seriousness to do business with India, Harper signed a C$350 million (approx US$280 million) deal on April 15 to supply 7,000 pounds of uranium to the Hindu state. In 2012, Canada agreed to lift a moratorium on nuclear supplies to India. This was imposed in 1974 after India used Canadian supplied Candu reactors to make a nuclear bomb that was detonated in May 1974. The previous year Indira Gandhi had visited Canada in the footsteps of her father Jawahar Lal Nehru in 1949. Nehru was India’s first prime minister after the country gained independence from Britain. As in the supply of Candu reactors to India, the uranium deal was mentioned in the context of its use for peaceful purposes. Skeptics could be forgiven. After all, when India exploded its first nuclear bomb in 1974, it said it was for “peaceful purposes.” The Indian-doting Western media immediately started parroting this line. Hindu India, like Zionist Israel, can do no wrong. The wily Hindus have cultivated an artfully crafted image of non-violence when in fact, it is the most violent country in the world. It has waged wars against each and every one of its neighbours except tiny Nepal, which lives under its boot. Much of this also has to do with the politics of Karamchand Gandhi who was erroneously given the title, “Mahatma,” meaning great soul. It is akin to the Christian concept of a saint. He cultivated an image of being a champion of non-violence and poverty. His non-violence was reserved only for the British colonialists, not the Muslim, Christian or Sikh minorities. Even Dalits, the original inhabitants of India, are treated so appallingly bad that it would put any human being with even an iota of decency to shame. Not the Hindu racists. Dalits cannot pull water from the same well and they cannot share utensils with the so-called upper caste Hindus among many other forms of discrimination. What gives them this “higher” status? Did Gandhi’s “mahatama’ status eliminate discrimination and racism against Dalits? Perish the thought. True, Gandhi called them Harijans — meaning children of God — but that did nothing to dissipate the deep-rooted racism of the Hindus. Did Harper even once bring up the subject of religiously sanctioned apartheid in India? Canada, like a number of other western countries, has established what is called the office for the protection of religious minorities. This is basically used as a battering ram against governments and countries the West does not like. Thus, Muslim countries are frequently vilified if religious minorities such as Christians are mistreated. 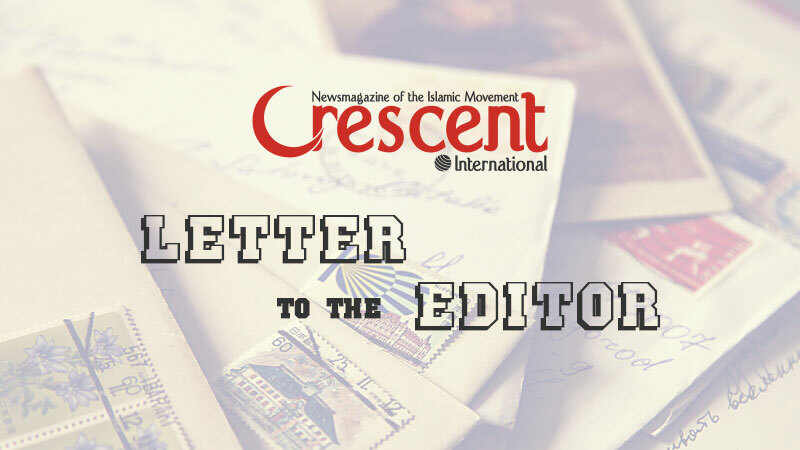 There is nothing wrong with protecting the rights of Christian minorities and those Muslim countries that mistreat their Christian citizens should be held to account. The hypocrisy kicks in when predominantly Christian countries mistreat their Muslim citizens. This has become quite clear in most parts of Europe as well as North America. Further, Zionist Israel and Hindu India can even persecute Christians but they will never face any opprobrium. If Muslims are persecuted, well they are up to no good anyway and deserve what they get. Harper may have turned a blind eye to the egregious crimes perpetrated against religious minorities in Hindu India, but not all Canadians were willing to accept such conduct. When Modi came to speak at the Exhibition Place to a doting crowd of Hindus, admittedly several thousand, there were brave souls with placards and bullhorns drawing attention to Modi’s horrific record and Nazi characteristics. Protesters included members of the Sikh community, Kashmiris as well as mainstream Canadians who care for human values and dignity. 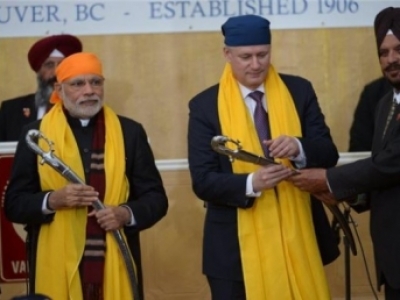 There were even larger protests in Vancouver where Modi and Harper visited a gurdwara (Sikh place of worship) and a Hindu temple on April 17. While both places were protected by heavy contingent of police, that did not deter the protesters from reminding those who came to hear Modi that he had come with his hands drenched in the blood of innocent people. The Gujarat pogrom of February 2002 will come to define Modi’s record. It had started in the wake of a fire in a train at Godhera station in which 58 Hindu pilgrims died. It was immediately alleged that Muslims had set fire to the train. A judicial inquiry led by a justice of the Indian supreme court found that a kerosene cooker had tipped in one of the carriages causing the fire. The inquiry took several months but before that, thousands of Muslims were butchered in cold blood on an unsubstantiated allegation. What is equally appalling is that Modi as chief minister of Gujarat not only did not stop the pogrom, he actually ordered the police not to protect Muslims. All this is well documented yet Western rulers are falling over themselves to appease this mass murderer for a few million dollars. Harper threw a state banquet for this Hindu Nazi as he wrapped up his state visit. Has anything changed in India since the judicial inquiry into the Godhera fire and the Gujarat massacre? Modi and his fascist allies continue to breathe fire against Muslims. He is closely linked with the Shiv Sena, an armed Hindu fascist outfit that takes pride in perpetrating violence against the hapless Muslim citizens of India. A few days before Modi’s arrival in Canada, Sanjay Raut, a member of parliament of Shiv Sena demanded that voting rights of Muslims in India be withdrawn. While Modi was being feted in Canada, his party mouthpiece Saamna called for compulsory “family planning” — a euphemism for sterilization — for Muslims and Christians. This is not the first time Hindu fascists have publicly talked about such subjects. Sadhvi Deva Thakur of the Hindu Mahasabha said an “emergency” should be declared in India to force Muslims and Christians to undergo sterilization. Modi has made no effort to stop such racist cant from spreading. His silence in the face of racism is actually encouraging the hate-filled Hindus from venting their anger against the hapless minorities, be they Muslims or Christians. Perhaps, he has found a soulmate in Harper who has been on a similar Islamophobic campaign in Canada.